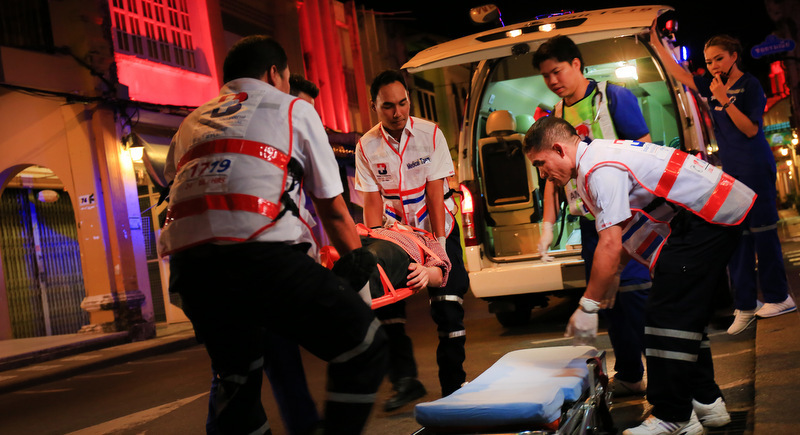 PHUKET: Bangkok Hospital Phuket has confirmed to The Phuket News its stance on emergency care for patients under the new Universal Coverage for Emergency Patients (UCEP) law brought into effect on April 1. The new law, administered by the National Institute for Emergency Medicine (NIEM), enables all patients who require emergency medical care and assistance to be able to access it wherever they are in the country at whichever hospital – private or state – is closest to them for a period of up to 72 hours. However, the law recognises that it is is ultimately down to the doctors in charge to assess each situation independently. Bhummikitti Ruktaengam, Assistant Hospital Director at Bangkok Hospital Phuket noted, “As for entitlement, people who access the UCEP rights must be a member of one of the three government national healthcare plans: the National Health Security Fund, Social Security Fund or the fund for medical welfare to state officials. “People are advised to contact 1669 as standard when a medical emergency occurs and the operators and paramedics at the scene, or doctors at the nearest hospital will be able to determine the severity of the problem and make an informed decision whether the patient falls under the UCEP categories or not. “If they do not, they will be transferred to their registered state hospital if safe and possible to do so,” he said. “If after the 72 hours, the patient still requires medical assistance, they will be transported to their registered government hospital for further care if safe to do so. Patients will also have the choice to stay at the first hospital at their own expense. In case the patient is cared for and no longer in a critical condition, it is possible for him/her to be referred to another hospital faster than 72 hours,” Mr Bhummikitti explained. “As the UCEP plan includes private hospitals, Bangkok Hospital Phuket is hopeful that people in Phuket and nearby provinces will have much faster and easier access to key emergency medical assistance without having to travel to a government hospital which sometimes may be further away and risk the life of the patient due to longer travel times. “Besides, our hospital will always focus on effective and consistent communication with patients and their relatives regarding their rights and every step of treatment for their clear understanding and further arrangements,” he said. Banyat Kantha, Chief of the Phuket Provincial Health Office (PPHO), has so far refused to comment to The Phuket News on the UCEP emergency care law. “This has nothing to do with me. Go ask NIEM,” he said. Mr Banyat, who as PPHO Chief is the leading Ministry of Health official for the entire island and oversees the administration of all public health facilities in Phuket, including the three government hospitals in Phuket Town, Thalang and Patong. Kurt...can't you read or understand the article? Anyway, all this concerns only thai people who are in one of the 3 thai government healthcare plans. It is not for expats, retirees or tourists. Right? Who will pay for this "free" care? As ever it will be the people that pay for their own care. If you are a paying customer or you pay for insurance then expect your costs to increase. Marcher/Kurt...why dismiss him? You two don't make any sense. It's not a question of hospitals agreeing - it what the law proscribes. What's the point of getting a response from Mr Banyat, when the article describes what the law entails? I agree with Kurt. Get rid of useless piece of .... If BKK Pkt hospital agrees to this does it also apply to their sister hospitals International and Dibuk? Well, that PPHO chief can be sacked, he is good for nothing. His saying:... "it has nothing to do with me"... makes your trousers fall down. Phuket is not in need of such dead wood 'officials'. What actually than has to do with a PPHO Chief? What is his function description?